Nike Women Toronto celebrated a weekend of women in sport from June 11-14. Approximately 13,000 athletes participated, supported, encouraged, and came together to run and train their way to a personal best. As part of the Nike Women's Race Series, 10,000 women gathered at the start line on Toronto Island on Sunday, June 14, to fuel their passion for running. 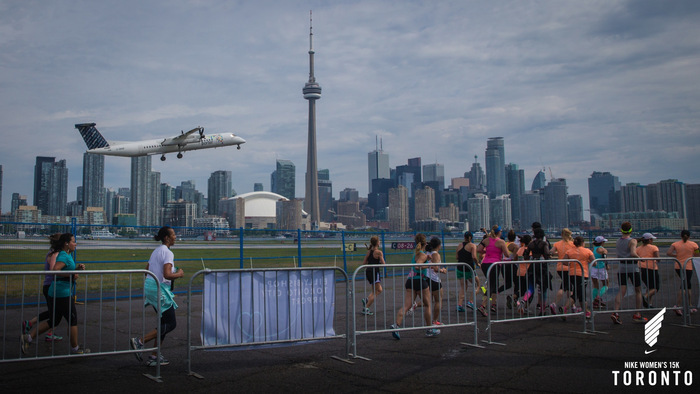 After a solid 10 weeks of training, some 10,000 runners pushed themselves to go farther and faster while running the Nike Women's 15K on the Toronto Islands; through neighbourhoods, parklands and along the runways of Billy Bishop airport, all set against the backdrop of downtown Toronto. The adrenaline was at an all-time high. Hearing and feeling the planes take off and land as you ran across its runway was exhilarating to say the least! Spectators and supporters cheering you on as you crossed each kilometre made you push even harder and faster. Performances from bands and choirs were a refreshing surprise after running a few kilometres surrounded by just nature. And the scenic view of sailboats floating atop an oasis of serenity waters while running on the bridge before the finish line put runners at a place of Zen. Everyone finished peaceful and strong. It was my first official race and my nerves the night before were going bonkers - I barely slept! I didn't know what to expect, I just knew I was anxious and ready to run! Firstly, I was put in Wave 4 which clocks in at a pace between 5:30 to 6:00 per kilometre when I really wanted to be in Wave 3 (5:00 to 5:30 pace) with the rest of my running crew. They had made an announcement that runners weren't allowed to go up a wave, only down. Nonetheless, I didn't stress it at all. I thoroughly enjoyed running on my own and getting in my own zone. Secondly, it was a cold and very wet start to the race but that was least of my worries. I was actually hoping for rain or cooler temperatures rather than hot, humid, and muggy. I guess it worked in my favour. Thirdly, I can't say I'm proud of my time because I knew I could have finished a solid 10 minutes before my clock time. I was stuck in a sea of runners for a chunk of the race path and found it difficult to maneuver and get in my groove but I guess that comes with it! Next time I know, use them elbows (kidding but not kidding)! Nonetheless, I'm very proud to have successfully completed my first race ever! I felt good by the end of it; I wasn't overly tired and I was in complete control of my breathing the entire time. It was definitely a proud and memorable moment for myself. Now I'm addicted to running and motivated more than ever to try new challenging marathons! Marlen Esparza is a professional female boxer and olympian who finished 14th alongside Joan Benoit Samuelson, an American Olympian Marathon Runner in a time of 1:01:44. Paula Findlay, Canadian triathlete finished first in a time of 53:40. It was inspiring to have personally met and shared my first 15K race with such motivating and supportive athletes, let alone 10,000 other amazing women! It was such an honour. I was emotional by the end of my race, I shed a few tears because I was overwhelmed by the entire race weekend. It was such a blessing and an all-time adrenaline high to have experienced it all. I physically and mentally challenged myself and I am #BETTERFORIT. Currently, I'm in preparation to train for my first half-marathon race in October for either the San Francisco half-maraton or the Scotiabank Toronto Waterfront Marathon!